The Freedom From Religion Foundation has sent letters of warning to 350 school districts across the United States cautioning against allowing a disturbing evangelical group into public schools to convert students. FFRF has sent its letters and a report entitled, "Closing the Doors: Why the Todd Becker Foundation Must Not be Allowed in Public Schools" to school districts located in Minnesota, Iowa, Missouri, South Dakota, Nebraska, Kansas, Oklahoma, Wyoming, Colorado and Texas. The report notifies the school districts that they may face legal liability if they permit the Todd Becker Foundation to proselytize to their students. Each of the school districts that FFRF wrote to has either hosted or allowed its students to attend an assembly put on by the foundation in the past. 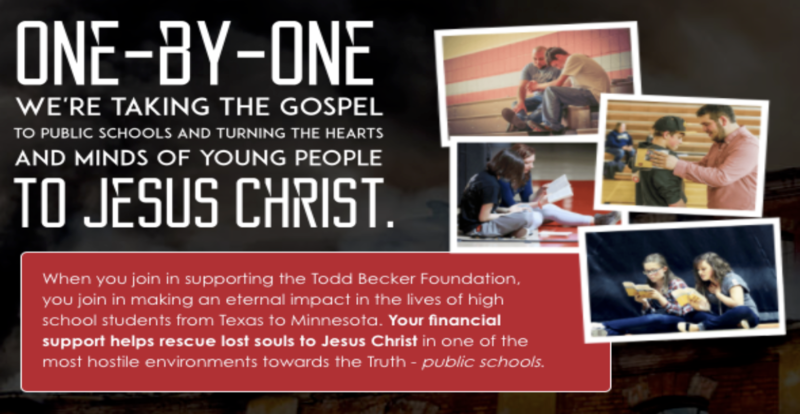 The Todd Becker Foundation targets high school students, seeking to convert them into fundamentalist Christianity. The foundation is a Christian ministry that travels throughout the Midwest putting on assemblies in public schools. At each school, the foundation puts on two separate assemblies. The first is an afternoon assembly held during school hours that focuses on two questions: "Where is your life headed?" and "Where will you go when you die?" During the in-school assembly, students are encouraged to "take the narrow path," a reference to a bible verse that the program centers around, Matthew 7:13. The second assembly takes place in the evening and involves proselytization and a presentation of the foundation's full faith-based, Christian message. Additionally, the foundation partners with local churches and invites local clergy members to help proselytize to students after its assemblies. After both the in-school and evening events, students are encouraged to sit down with foundation staff members and local clergy one-on-one to discuss their religious beliefs. 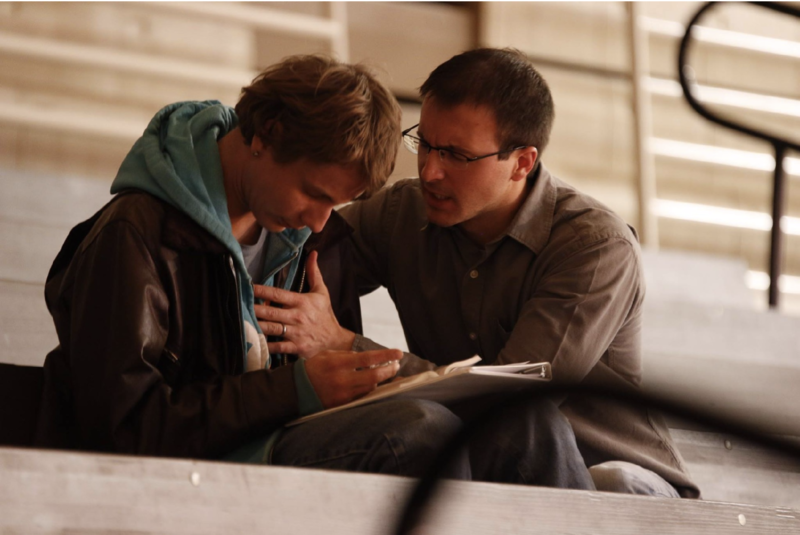 During these one-on-one conversations, the foundation "shares with the student the gospel of Jesus Christ and points them to the hope of a new beginning found in Christ." Not only do foundation members discuss their religious beliefs with students, but students are asked to profess to these strangers a personal decision " to surrender their life to Christ, or to walk away from Him." The FFRF report rebuts claims by the Todd Becker Foundation that one-on-one student evangelizing is permissible because they are the "student's own choice." The report says, "Far from spontaneous student-initiated conversations, these one-on-ones are the entire purpose of the assembly. The entire program is designed to elicit an emotional response from students, identify those students who are ripe for proselytizing, and single out those students for one-on-one proselytizing." "These shocking school assemblies are not only problematic from a constitutional perspective, but they are a deeply disturbing and harmful assault on the students' right of conscience," says FFRF Co-President Annie Laurie Gaylor. The report highlights a particularly troubling story from the Todd Becker Foundation newsletter that describes the foundation's interactions with a girl in Kansas who was in a relationship with another girl. A foundation member read bible passages to the girl explaining that homosexuality is a sin. Later, during a foundation evening event that the girl and her girlfriend attended, the team member and Ministry Director Keith Becker sat down with these two girls and "showed them through Scripture how this was not God's plan for their lives and how Satan had twisted their perception of God." FFRF also reminds these districts that public school administrators should only be inviting speakers that foster a welcoming environment for all students and enhance their education. Speakers with a religious mission that cause legal problems for the district and controversy in the community have no place in a public school. An Iowa superintendent who felt that the foundation delivered a "really good message" about how drinking can affect students' lives changed his tone after learning the foundation was reportedly spreading anti-gay and anti-Mormon messages following the in-school assembly. "If I had known that would have been the case, they would not have come into the building," he later said. "Public school administrators have an obligation to protect students from proselytizing adults while they are at school," FFRF's report concludes. "In order to protect students' rights and comply with the Establishment Clause, the Todd Becker Foundation must no longer be allowed to present in public schools." FFRF is considering taking legal action to protect students' rights and is at this time asking parents and students whose schools have allowed in the Todd Becker Foundation to come forward. The Freedom From Religion Foundation is a national nonprofit organization with over 30,000 members and 20 chapters across the country, including chapters in Colorado and Minnesota. FFRF's purposes are to protect the constitutional separation between state and church, and to educate the public on matters relating to nontheism.